It's All About Books: The Sunday Salon: March Came Like a Lion! Outside my window: It's sunny and cold, but so nice out there. We are tempted to open all the windows and air out the house, but have discovered it's still a bit cold for that idea. It's a beautiful day though. Song of the week: I just really like this song... how about you? Reading Report: is a very very boring report this week! Books currently reading: see above! Books I'm anxious to read: see last week! I am thinking: as always when I write this post... why? Ugh, I have to talk myself into it every week. I'm grateful for: my big kids that rearranged their schedules and sacrificed their Saturday morning sleep in time so we could all be together for a family event yesterday. You are awesome! What I learned this week: that sometimes you just have to post two things a day to your blog. Sometimes, there's lots to say and sometimes there's not. This week, I can't even think of a thing I'll be posting! The week after that I'm planning some fun blogiversary posts, but this coming week is a big blank! I hate that. And this is not a new learned, but something I seem to learn over and over again. Around the house: People, I am happy to report that I took on the soap scum and WON! I found a Mr. Clean Magic Erasure just for soap scum and it actually worked! The bath tub looks awesome! Family Matters: we survived parent teacher conferences. My kids are quiet, have I have told you this? I have very quiet kids, that's what the teachers say every single time! Letter Writing Month: Is over, sadly. But this past week I got two letters! Thank you to my letter writers! The coming week: There's a library event starting this week which I will be heavily supporting. Yes, I think I'll be there a lot. And in fact, I'll be participating at the end of the month. More on that another time! Also this week, several birthdays in our family to celebrate, including my daughter (and baby) who will turn 13 years old! No freakin' way! I think I could get all of them if I use Shazam. But then again I don't know if some of the songs are played long enough for it. No cheating allowed, sheesh. How long does Shazam need to figure it out? I will have to remember that next time I make one of these! Banana cookies? I've never tried using the past-their-prime bananas for cookies. Sounds delicious! Glad to know that the Mr. Clean Magic Erasers for soap scum work - I have such a time with my shower doors and have never found anything that really works. Lisa, ah you really should try banana cookies. I do this more often then bread actually. I NEED that soap scum eraser. Where did you find that?? ?Gosh, over Spring Break I might just use it on the shower....NOT. But it's a thought, and if I have it you never know when the urge to use it might arise. You know, blogging about your everyday moments are what make your blog so fun and fresh. Don't think that you need a mind-altering moment to blog about. Enjoy it all. Alright! That's it! I'm about two seconds from calling you and making you listen to those songs with me on the phone and having you tell me what they are! I know a few of them, don't know some at all, but some sound so freaking familiar and I can't stand that!!! Argh, it's going to drive me nuts! 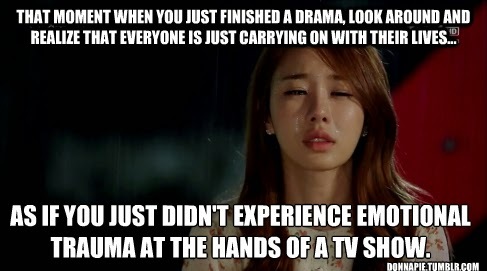 I don't know what's up with all these TV shows taking a break but it's driving me nuts! Don't the networks know I don't have a life and need TV?! Falling Skies looks awesome, though! We all have those weeks where you ask yourself how many posts you should post a day and those weeks where your grasping at straws. I'm thinking this week is going to be bad for me too. If I could just finish a dang book! LOL! I totally would have to agree with your kids' teachers. They are very quiet...all of them. That's OK, I'm pretty quiet myself. The question is, do they talk more when you get to know them or are they always quiet? For grasping at straws, you did a pretty awesome and popular post today! Oh, and I love The Gotan Project. I have one of their CDs and when through great lengths to get it from the car I totaled. I think I know #6! (The Man From Snowy River?) And since I am so not a movie buff, I am glad to even recognize one! A few others sound familiar, but most I didn't recognize. You need to post the answers sometime. And a very happy and excited unsuspecting blog reader she was! Thank you again! You are welcome! And yes #6 is Man from Snowy River. LOVE that movie! I enjoyed watching a movie together. We must think of another! Did you want to do any sort of post about the experience?